I have been using inverters for many years for different applications. One of the most powerful uses years ago was in being able to use power tools such as a circular saw where there was no plug in electricity available by attaching an inverter to a car battery. Another great use is as a portable generator for a power outage. Most inverters input 12 DC from a battery such as a car battery, solar cells or wind generator and provide 110 or 220 volts AC. Grid tie inverters are a special type which sync generated electricity with the power grid and are designed to be “plug & play.” They must of course be coordinated with your local utility company. I wanted to emulate a battery pack so I took a small 12V battery used in a project 7 years ago, the 750 watt inverter I have owned for at least 10 years and grabbed the first thing that I knew would work, an old camera bag. The bag was much bigger than required but will help in finding a better solution. Next I want to determine how long this battery will power the trimmer. Phase 2 will be using this scenario to power a small corded electric mower. 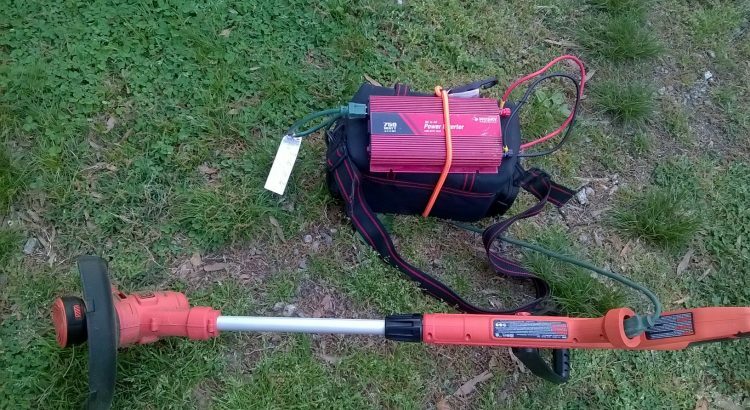 There are 2 basic ways to use a corded mower without using a long power cord. 1. Using an inverter as above. 2. Since the motor is DC and the AC power is being rectified (converted from AC to DC) use batteries (properly matched) to power it. I still plan to make an electric mower from scratch but that is a long term project. I had been eyeing a Ryobi One+ 18V mower but am considering a Sun Joe corded 14″ model for $ 79. I have a small area to mow and circumventing a long cord as in above could be easy with this model.